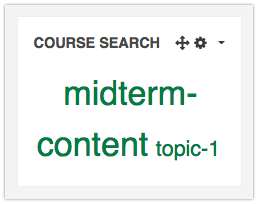 A new feature added in summer 2017 allows instructors to use tags to categorize resources and activities within their course. These tags can be used for any manner of internal organization schemes for instructor reference (differing content areas, meeting learning outcomes, exam material focus, etc.) and/or can be made into a searchable student-facing resource. Tags are entered by typing in the textbox and clicking enter - you will need to enter your tags exactly to have them match up with others in your course. Existing tags for the particular item appear in blue boxes above the tag entry field and can be removed by clicking the x icon. Multiple tags are possible for each resource or activity. 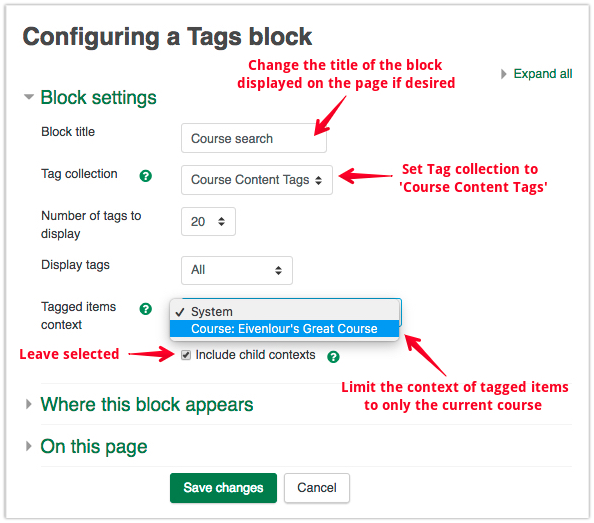 Once tags are entered, to view all the content items that have been tagged with the specific labels from your organization scheme, you will need to add a 'Tags' block. For more information about adding blocks, see this article. 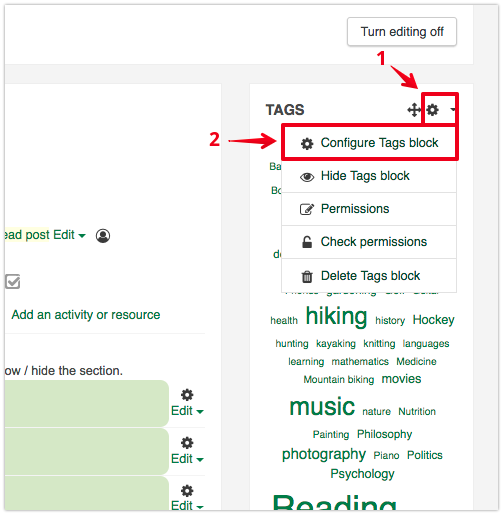 Initially, a default 'Tags' block will show all the tags available on the site, including all 'user interest' tags entered in profiles. Click on the gear icon near the top right of the block, then on Configure Tags block. Tags blocks display a word cloud of all the tags used in the context specified in the settings - in the image below only 2 tags have been entered in this course: 'topic-1' and 'midterm-content'. Tags that have greater frequency appear larger in the block. Clicking any of the tag labels will open a clickable list of all the specific resources or activities. 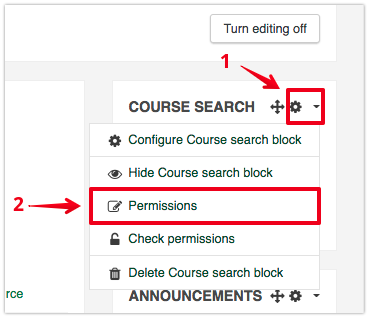 Note: For specific tags, it is not possible to remove the option for students to edit the tag description (click the Edit this tag link in the image above). Instructors also have the option of using tagging only for their own information, or for the reference of all administrators of the course (anyone not in the student role). 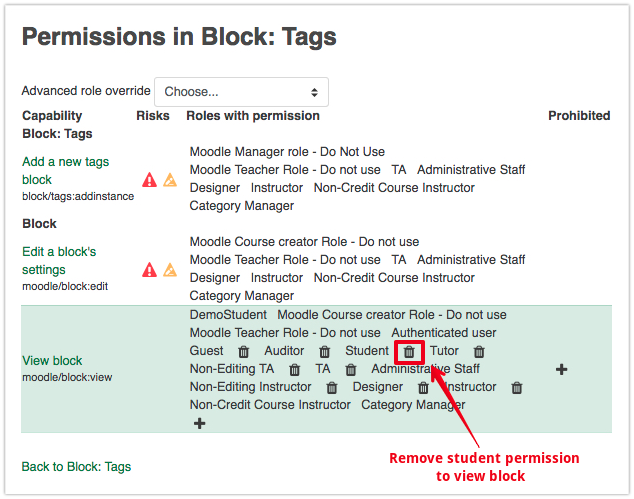 To do this, the permissions on the block need to be adjusted so that students (or any other specific role) cannot see it.